Shell’s 100-mile-long oil slick off the Nigerian coast, 21 December 2011. Envisat ASAR image analyzed by SkyTruth from data courtesy of the European Space Agency.Shell has admitted to spilling up to 40,000 barrels (1.4 million gallons) of crude oil into the ocean about 75 miles (120 km) off Nigeria on Wednesday. The spill occurred while it was transferring oil from a floating oil platform to a tanker. 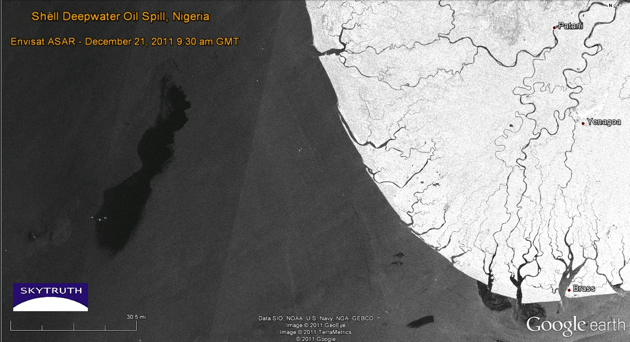 Satellite pictures captured by independent monitors Skytruth (more here) show a 356-square-mile (923-square-km) slick approaching the oil-battered coast of the Niger Delta. All production from the Bonga field—normally about 200,000 barrels (7.2 million gallons) a day—has been suspended in the wake of the spill. [A] leading Nigerian human rights group said Shell’s figures about the quantity of oil spilled or the clean-up could not be relied on. “Shell says 40,000 barrels were spilled and production was shut but we do not trust them because past incidents show that the company consistently under-reports the amounts and impacts of its carelessness,” said Nnimmo Bassey, head of Environmental Rights Action, based in Lagos. The spill, one of the worst off the coast of Nigeria in 10 years, is particularly embarrassing for Shell, coming only four months after a major UN study said it could take Shell and other oil companies 30 years and $1bn to clean spills in Ogoniland, one small part of the oil-rich delta. The company also admitted responsibility in August for two major spills in the Bodo region of the delta that took place in 2008, but has yet to pay compensation. Shell also admitted to a spill in the Gulf of Mexico Sunday of some 13,400 barrels gallons of drilling mud mixed with synthetic oil from the Deepwater Nautilus—a sister rig to the Deepwater Horizon. The Appomattox project is at the heart of a high-stakes dispute between environmentalists and the federal government over offshore drilling… In separate cases that have since been consolidated, conservationists are arguing that the government acted prematurely in green-lighting the plan without first finishing an environmental study of the Gulf… The cases present a major test of the federal government’s power to swiftly review and approve deep-water exploration plans. A New BP Leak in the Gulf of Mexico?